Institute's Michael McCrudden, netted a brace against Warrenpoint Town. CAPTAIN fantastic Michael McCrudden was Institute's match winner over ten men Warrenpoint Town. 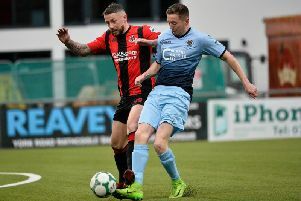 The striker, who was their hero in their opening win over Newry City, netted a brace, as Paddy McLaughlin's men made it two wins in a row at the Brandywell. The victory puts more pressure on Warrenpoint, who are still searching for their first point of the season, and things don't get any easier as they host wounded champions Crusaders next weekend. Institute made two changes to their side which lost at Linfield, with Jamie McIntyre and Stephen Curry coming in for Callum Moorehead and Jake Morrow, who both dropped to the bench. As for Town, they rung the changes with five players - Berraat Turker, Anton Reilly, Connall McGrandles, Eamon Scannell and Robert Norton - coming into their starting line-up. The visitors had half a chance on two minutes but Alan Sullivan's tame left footed strike from 20 yards failed to trouble 'Stute keeper Marty Gallagher. Institute's McCrudden, went close on eight minutes, but after picking up Ronan Doherty's intelligent pass, his curling effort sailed just over Turker's crossbar. Just after the midway point of the first half Town's Norton saw his 25 yard powerful strike, which had Gallagher struggling, flashed just over. after a heavy challenge on Jamie McIntyre. It took 'Stute six minutes to make their man advantage count as they broke the deadlock from the penalty spot on 36 minutes. McCrudden's clever feet caught out Scannell and the Town defender brought the striker down, after dusting himself down the ex-Newcastle United starlet, stepped up and slotted the resulting spot-kick low into the bottom left hand corner. Town made a change at the break with Seanan Foster replacing Francis McCaffrey and the substitute made a super last ditch tackle to deny Stephen Curry, a cert goal, after the winger had broken the offside trap. On 60 minutes Gallagher had to make a stunning save to keep out Norton’s 20 yard deflected free-kick, as the keeper was going the wrong way, he still got back to keep the effort out. That save proved to be a turning point as the home side doubled their lead on 66 minutes, as McCrudden’s stunning 25 yard strike on the half-volley, gave Turker no chance. In the closing stages 'Stute substitute Gareth Brown was denied a goal, as his left footed strike was well kept out by Turker. Right at the death, another flowing move by Paddy McLaughlin's men ended with McCrudden firing wide, as he looked to complete his hat-trick. Institute: Gallagher, R Morrow, Bonner, D Curry, McLaughlin; McIntyre, Harkin (Jarvis 63), Doherty, Dunne (Moorehead 47); S Curry (Brown 75), McCrudden. Warrenpoint Town: Turker, Hughes, Reilly, Kelly (Lynch 77), McGrandles, Sullivan (Houston 77), McCaffrey (Foster HT), Scannell, O’Connor, Norton, Wallace.